Solvatten was founded in 2006 by the innovator and artist Petra Wadström. The market for small-scale purification of drinking water is global, and the invention is supported by the World Bank. Number of employees: Six, including project managers in Sweden and Nepal, and four consultants. Headquartered in Stockholm. Revenue: SEK 900,000 (€83,000). Petra Wadström has co-operated with the Swedish company Mälarplast AB for nearly two years to develop an easily manufactured product employing materials chosen for proper functionality at a low cost. The first 1000 mass-produced Solvatten units will be delivered in 2009, and a pilot project in Nepal will test 90 units in homes, schools and health centers. Petra Wadström explains how the Solvatten water purifier works. More than a billion people currently lack access to clean drinking water. One result of this is the deaths of many children from preventable diarrhoeal diseases and intestinal parasites. It is estimated that more than 1.8 million people die each year from illnesses caused by contaminated drinking water. Of course there are many different methods to clean drinking water, but most of them are based on large-scale plants and access to electricity. The Swedish inventor Petra Wadström’s “solvattendunk” — literally, “solar water container” — makes it possible to fetch, store and purify drinking water. And it’s done with the help of solar energy, requiring no electricity from batteries or mains. The equipment is currently being tested in Nepal and India as part of a World Bank-sponsored project. Let’s say you’re in a rural part of India, and you’re uncertain whether the water from a shallow well is safe to drink. Here’s what you do: Fill the two-part plastic Solvatten container with 10 litres of water, open it like a book at the hinge in the back lay it in the in the sun. After three to five hours, all micro-organisms have been killed and the water is at a temperature of approximately 55° C. The indicator now shows green instead of red, which means you can allow the water cool and then drink it. 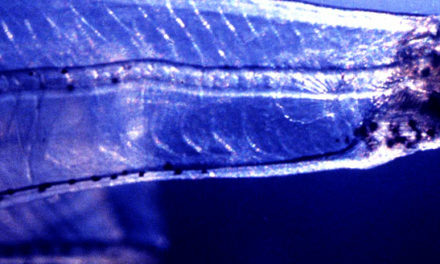 There is now almost no risk of diarrhoea and other microbial diseases from the water. Using Solvatten twice a day instead of boiling water over a wood fire produces 20 litres of clean, hot water and saves about 20 kg of firewood. The water is of course suitable for cleaning and bathing. Contaminated water is poured into the two-part plastic tank body. First, a fine filter removes particulates and larger organisms. Then, when the Solvatten container is opened, a transparent layer over the inside panels exposes micro-organisms to the sun’s ultraviolet radiation, which is deadly for bacteria. At the same time, the UV radiation is transformed into long-wave radiant heat, causing the water temperature to rise. Now the water begins to circulate, exposing the micro-organisms to more UV radiation. Solvatten purifies 10 litres of water in three to five hours. 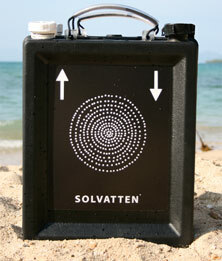 The design of the Solvatten container is simple, using no batteries or advanced technology. The container is easily cleaned, for example by laying it in the sun filled with rice or lentils. Each unit costs SEK 300 – 400 (€30 – €40) and lasts for five to six years. The cost per litre of purified water can be well under a penny, or as little as one-tenth the cost of water delivered by tanker truck in Nepal. Solvatten is easily scalable for various needs, for example in relief efforts following natural disasters or in expeditions to areas without access to clean drinking water or electricity. Solvatten has been tested and proven to work in most parts of the world. Even at 3,000 metres in the mountains of Nepal, clean water was produced in less than five hours despite wet, cold weather and low levels of available UV light. The invention meets the World Health Organisation standard for “safe water”, defined as less than one E. coli bacterium per 100 ml of water, and its water-purifying capacity has been verified by IVL, the Swedish Environmental Research Institute. In 2008, Solvatten received the prestigious Skapapriset (Creator Prize) and a grant from the City of Stockholm and Lions Club. Article published in April 2009.